Pink, in a pot, perfect. 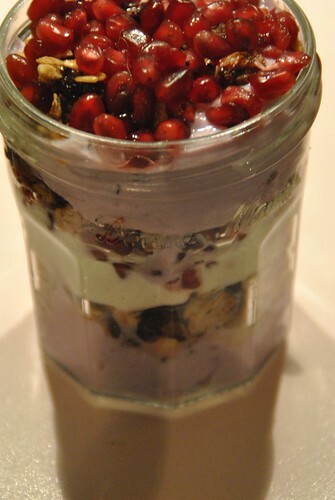 Pomegranate seeds layered with blueberry and vanilla fat free greek yoghurt form Fruyo and home-made granola. That’s it – that’s the recipe – 4 things +jam jar +layering. It’s even portable. Well, ok the granola recipe is below but you could buy that. Now I come to think of it, it’s also rather valentine-appropriate, but if it’s all a bit ‘princess’ for your tastes then scroll down for a banana and pecan version. 550g standard muesli with fried fruit and nuts. Heat the honey a for a couple of seconds in the microwave. Mix everything together in a large bowl. It needs to be coated, so you might need a touch of extra oil. Spread out on a tray lined with parchment paper or a baking mat and bake in the oven at 130C for 25mins, stirring half way through. Turn the oven off and leave to cool in the oven. Simple though this may seem, it wasn’t my idea. It was inspired by the recipe below sent to me by the makers of Total Greek Yoghurt / Fruyo. Since the end of January the new Fruyo flavours which I tried recently, have been available in Sainsbury’s and Waitrose. The full range is now: peach, cherry, vanilla, strawberry, lemon, blueberry. My parents laugh at my ongoing yoghurt supplies, but Dad’s succinct review was “there’s a good amount of fruit in this” and the pot was left clean. I wanted a coloured layer in the pot so chose the blueberry but actually the lemon Fruyo is amazing with the poppyseed granola. I’ve also used the vanilla in my Valentine chocolate cake, which will soon be featured over at Rangemaster’s blog. 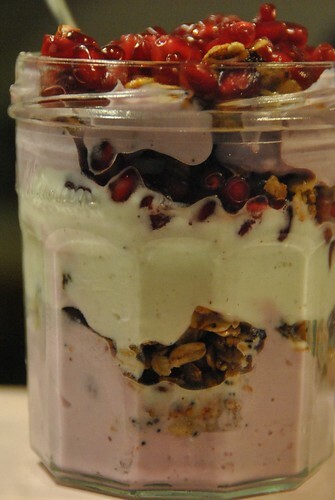 Mix the granola and nuts together and divide between each jam jar. Dice the banana and toss in the lemon juice to help prevent browning. Sprinkle the banana over the yoghurt in an even layer. Top with another thin layer of yoghurt. Drizzle over a third of the syrup and cover with the remaining yoghurt. Top with the remaining syrup and put the lids on the jars (or cover with cling film). Leave the jars for a minimum of three hours, allowing the flavours to develop. I was sent a selection of Fruyo pots for the purpose of making this recipe. I was not required to write a review. All opinions are my own. Thanks very much though Fruyo – they are lovely! This sounds lovely – a real treat for breakfast. That looks lovely! I prefer granola with yoghurt to milk in a lot of ways. And thank you for the link!